Spoon Me Frozen Yogurt Store. 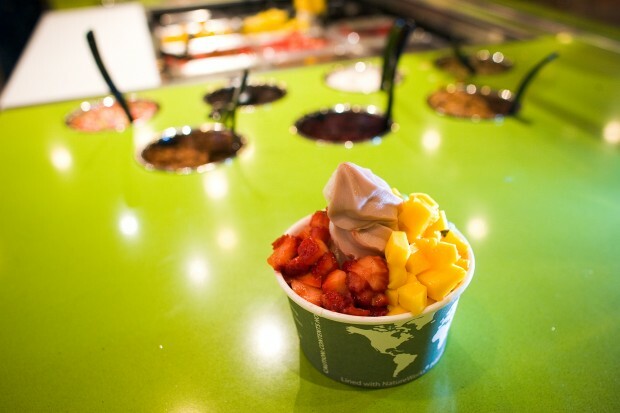 Where to buy Frozen Yogurt. Spoon Me yogurt was started in Provo, Utah and has since franchised and is now located in California, Canada, Ohio, and New Jersey with more stores opening soon in other states. 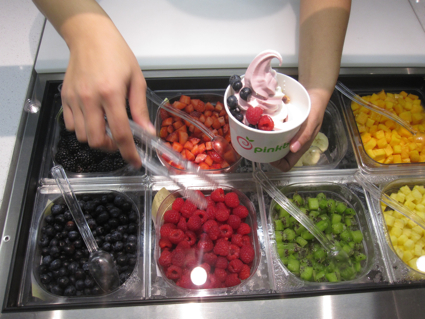 They yogurt they serve is refreshing and tart made from a powder mix that they add water to in the store then freeze an d serve directly to you after they top it with whatever fruit, candy, cereal or nuts that you want. Spoon Me yogurt has the least calories per serving of all the store brands at under 90 calories per serving for the original tart flavor compared to the 110 calories per serving that other variety’s have. It contains no table sugar only fructose, the same sugar that you consume when you eat and apple or banana. The Spoon Me motto is Love your body, love the environment, and love the community. Spoon Me uses biodegradable bowls, napkins and utensils that take about 90 days to decompose if left in our environment. Spoon Me also started the “Keep the Change Charity” that encourages their customers to donate the change from their purchase to whatever local charity they are promoting that month. Spoon Me comes in a variety of flavors including: Acai, Tart, Belgian Chocolate, Blueberry Tart, Cheesecake, Creamy Orange, Cucumber, Georgia Peach, Lemon Tart, Lime Tart, Mango Tart, Passion Fruit Tart, Pina Colada, Pomegranate Tart, Pumpkin, Raspberry and a few others. This is the best tasting tart euro style yogurt around unless you want the Peanut Butter Cup yogurt from Yogurtland. But isn’t that more like ice cream? Add 60 more calories per cup anyway. I wish they had more flavor and I wish you could mix your own yogurt. But, this is my favorite. 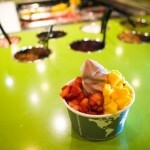 Previous post: Where Can I Buy Frozen Yogurt Mix?